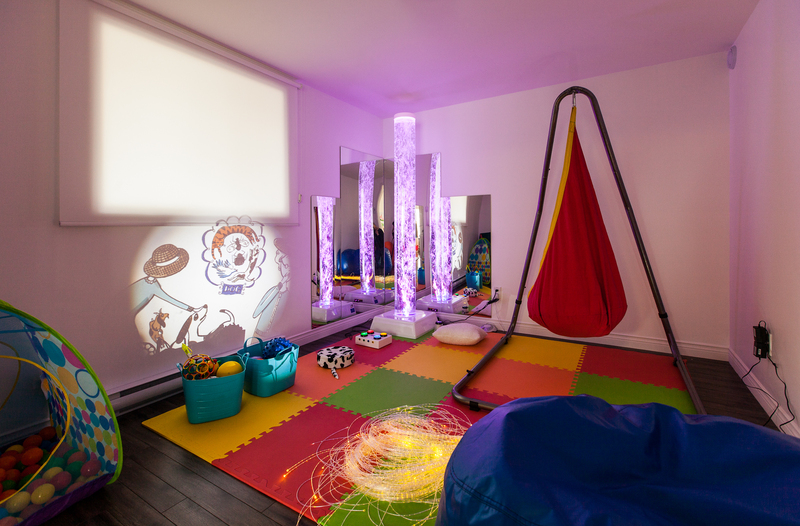 Little Tulips Family Child Care is proud to offer a Snoezelen experience right in our child care home! A Snoezelen Room is a controlled multi-sensory environment. The concept of Snoezelen was defined in the late 1970s by two Dutch therapists while working at a centre in Holland. The centre supported individuals with developmental disabilities. The Snoezelen concept was originally developed to provide appropriate relaxation and stimulation for children and adults with developmental challenges. The Snoezelen room is a sensory room filled with sights, sounds and movement that can be experienced by participants on various levels. This room provides an opportunity for quiet, reflective and relaxing activities as well as an opportunity for more social and interactive experiences. Today, Snoezelen environments are created for children and adults with disabilities, seniors with senile dementia, individuals with mental illness, and persons with chronic pain, challenging behaviors, and brain injury. Snoezelen includes a wonderful blend of sights, sounds, textures and aromas within an environment that is filled with a variety of images, colors, easy to use devices, buttons, switches, and easy to grasp objects with different textures. The Snoezelen environment is safe and non-threatening. Participants experience self-control, autonomous discovery and exploration within an environment that is self-directed. These environments allow clients to enjoy a wide range of sensory experiences – either passively or actively – that enhance therapy, learning, and relaxation. A Snoezelen multi-sensory environment provides opportunity for the participant and caregiver to improve communication, enhance their understanding of each other, and build trust in their relationship. Whether for therapeutic purposes or just stress relief, a reduction in the noise factor of daily life benefits the body and mind. Snoezelen delivers sensory experiences that stimulate the primary senses of sight, hearing, touch and smell. Free from the expectation of others and the pressures of directed care, Snoezelen Room participants experience self-directed exploration, relaxation, and stimulation, leaving participants free to respond to these new sensations in their own unique ways. how do I put a room together for an autistic boy of 9 years old with a lot of musical interest and a lot of insecurities?